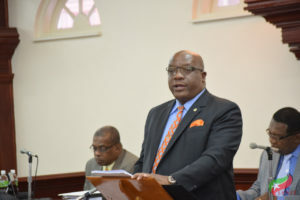 Basseterre, St. Kitts – The Federation of St. Kitts and Nevis’ absence on the European Union’s recently published list of non-cooperative jurisdictions for tax purposes did not occur by accident, the country’s Prime Minister and Minister of Finance the Honourable Dr. Timothy Harris, said Dec. 6 during his address to the nation on the 2018 budget. Indeed, St. Kitts and Nevis not appearing on the list, which is being referred to in the international media as “the European Union’s first blacklist of tax havens,” is credit to his government’s sustained proactive cooperation on tax matters. The Global Forum on Transparency and Exchange of Information for Tax Purposes is the premier international body that works to ensure the implementation of the international standards on tax transparency. It currently has 147 member jurisdictions, which include St. Kitts and Nevis. Fifteen international organizations participate as observers. Member jurisdictions’ compliance is monitored via an in-depth peer review process that assesses the standard of exchange of information on request. Phase 1 of the review process evaluates the quality of a jurisdiction’s legal and regulatory framework for the exchange of information, and Phase 2 assesses the practical implementation of that framework. Upon completion of both Phases, each jurisdiction is designated an overall rating. The Global Forum completed its first round of peer reviews in 2016 and a second round of peer reviews is now underway. St. Kitts and Nevis’ Overall Phase 2 Rating is “largely compliant” based on the first round of reviews; this is also the case for the United Kingdom and the United States. Canada’s Overall Phase 2 Rating is “largely compliant” (as at May 2017) based on the second round of reviews. On Aug. 25, 2016, St. Kitts and Nevis’ prime minister signed the OECD’s Multilateral Convention on Mutual Administrative Assistance in Tax Matters at the OECD headquarters in Paris, France, further demonstrating to the international community the federation’s commitment to implementing the international standards on transparency and exchange of information for tax purposes. During the last Article Four (IV) Consultation held in St. Kitts and Nevis, International Monetary Fund (IMF) officials affirmed the progress that is continuously being achieved by Harris’ government in strengthening the country’s anti-money laundering and anti-terrorist financing regime. This year, too, St. Kitts and Nevis joined the OECD’s Inclusive Framework on BEPS, which comprises more than 100 countries and jurisdictions that have come together to collaborate on the implementation of the OECD/G20 Base Erosion and Profit Shifting (BEPS) Package. It aims to tackle BEPS, which refers to tax avoidance strategies that involve artificially shifting profits to low- or no-tax locations.